This is more of an essay on personal events and ethics, and the energy behind this concept, but it’s a topic I feel is relevant to modern Paganism and Earth based spirituality. Consider it a pagan memoir piece. This word evokes from my imagination the Winged Nike, triumphant Valkyrie bearing noble warrior souls of the slain in battle to Valhalla, Boudicca riding atop her chariot to set Roman Londinium aflame. Thinking about modern figures of victory, I see Susan B. Anthony advocating women’s rights, Rosa Parks sitting on that bus, Martin Luther King, jr., giving That Speech, the high school students in Little Rock being escorted to class by National Guard troops, Sally Ride on a space shuttle… The 14-year-old girl recovering from a head wound she got for going to school… Figures from history, be it modern or ancient history, committing infamous acts creates a certain immortality of its own. 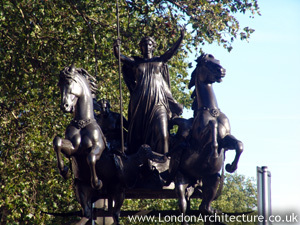 Boudicca on her glorious bronze Chariot. I took a picture of her pretty much like this, once. For me, Victory is a double-edged sword. It evokes simultaneously The Chariot and the 5 of Swords. With The Chariot, the only people on the “losing side” are those unfortunates who know no better than to stand in the way of the vehicle. Nonetheless the “losing side” must be considered a possible aspect of that card. You win, at what cost? The 5 of Swords is much more bleak. I’ve seen the word “Defeat” as a caption on at least one deck for that card, but even when reversed, I seem to remember an elaboration on the original meaning, modified by “inconsolable.” Other interpretations stress the reversed interpretation to mean burying the hatchet with someone, or transcending a conflict by withholding participation in petty gossip. Given my life circumstances, I felt drawn to write about this word for the Pagan Blog Project that I am so miserably tardy with. (I’m not giving up! I’m catching up!) Short story: my husband filed for divorce with me shortly after my 30th birthday (best. birthday. present. EVAR. ), and I just filed my answer. I won’t go into details because the case is ongoing, but I’m feeling optimistic about the outcome. Last November or so, I started working with Ganesh on my husband’s desk with a simple request: Please influence change in a positive direction, for my marriage. At Samhain of last year, I also began making plans and discerning work with Sekhmet for the following solar year. The husband found a girlfriend in February, as I was in full-on dedication mode to Sekhmet. I got spooked about the new relationship and tried to get him to call it off… he left me for the new girlfriend. This might seem at first like the ultimate spell back-fire. Friends of mine have chalked it up to further proof that polyamory doesn’t work for most people. It’s a little confusing, until you zoom in. In the moment when I see myself getting what I’ve asked for, I feel victorious over my fears that have been looming up to the moment of affirmative action. I also feel hesitant about the role my ego plays in claiming said victory. I learned early on that nobody likes a sore loser, but everybody despises a sore winner. I also wish to keep in mind that any experience of victory in this moment is just a small piece in a larger narrative, The Big Story. A singular favorable outcome does not alone determine the outcome of the whole. So it is with everyone, in everything: each victory in life, big or small, is party to a greater composition of events. 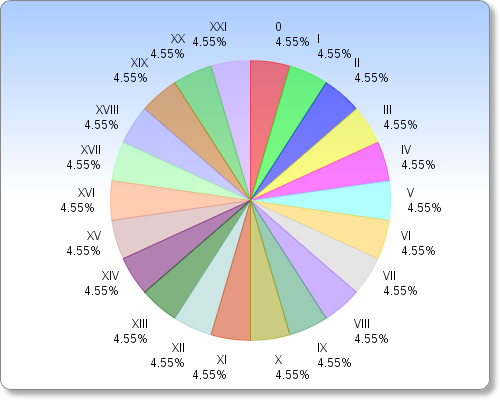 I’ve been thinking about the Tarot as a wheel, with all the cards in a circle, an inner circle for the Major Arcana, and a bigger circle for the Minor Arcana, so help me examine opposites in the system as a circle. This would place the victorious Chariot directly opposite XVIII The Moon. Makes sense to me: Chariot, controlled outward momentum leading to calculated success. Moon, sporradic, unpredictable, tuning into inner power. Our Inner Power often does crazy things, beyond our control, beyond our ability to predict (even especially in tune folk). As with everything, I have to look at the shadow side of victory. I have to make sure my ego doesn’t throw me off balance because this event is dominating my life at this time. That’s just the way it’s going, and I’m working to change that, to. The point of enduring failures is to learn from them. The Chariot evokes memories of specific events I felt led to failures in my life. The specific ones that come to mind were as a result of giving my power over to other people to decide my fate. Listening to someone else because I had tied my fate to them and that was all I knew. I’m done with that. My Goddess tells me so – the evidence in my forthright decisions and actions, with a supportive friend to back me up, but to whom I can say, “I’m sorry, I don’t want to go down that road with you” and she won’t take it personally to the extent of trying to manipulate me into giving her what she wants. She’s too confident for that, simply. This in itself is a situation I have been working with my magick to manifest, and it has come true. This has been a rough five months. Lots of travel, visiting relatives in the event of my grandfather’s funeral, and now the Turn of the Witch’s Year is upon us, which always adds to my retrospection. My biggest victory so far is the success I see Hazel making every day, towards growth and new abilities. My second biggest is making sure my life grows from the new roots, in gratitude, trust, and pure intention. I hope that this post hasn’t been too rambly, and that you my dear readers can see the relationship with the topic in my written wanderings.